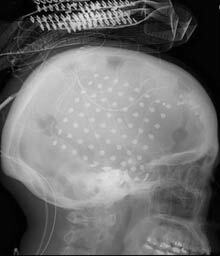 ECoG - electrocorticography - uses a grid of electrodes surgically placed on the surface of the brain; it monitors electrical activity. Eric Leuthardt and Dan Moran at Washington University School of Medicine, in St. Louis, and Gerwin Schalk at the Wadsworth Center, in Albany, NY, are developing a much smaller version that would be implanted long term to allow paralyzed patients to control a computer and perhaps prosthetic limbs and other devices. "We're extremely excited about these signals because they are really opening a whole new avenue for extracting information from the brain in humans," says Schalk. "The nice thing about ECoG is that it targets a space that no other sensor technology has been in before." "With minimal learning efforts, we have been able to tune and train the system to recognize simple commands, like 'up,' and 'down,' and 'left' and 'right,'" says Shawn Lunney, Neurolutions' chief executive officer. Lunney estimates that patients can control a computer cursor with approximately 80 percent accuracy. This technology may have significant benefits compared with other sensor implant technologies used to control external devices. ECoG can provide a higher level of control than EEG, which is susceptible to distortion as the signal travels through the skull and as the patient moves. 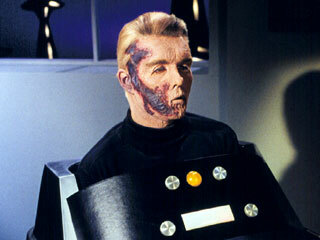 This is yet another line of scientific research that could lead to using nothing but the brain to efficiently control external devices, like Captain Christopher Pike's wheel chair from an original series Star Trek first broad cast in 1966.